Danskin Park Bearers are designed for installation on generally even subfloors. The surfaces of screeds, concrete subfloors or units must be sufficiently level to meet relevant Codes of Practice and Building Regulations. If they are not, the use of the Danskin Saddle Floor Levelling System is recommended. The building must be weatherproofed and wet trades completely dried out before commencing installation of flooring components. Isolated high points, mortar spillages and other debris should be removed from the area. All joints and air paths between concrete units and at perimeter walls must be grouted. Components exposed to wet conditions such as ingress of rain or plumbing leaks should be discarded and replaced. Excessive moisture from cast insitu slabs and screeds which have not dried out can have adverse affects on flooring materials and timber components. BS 8201 : 1987 states that “it is reasonable to recommend that the concrete be considered dry when the relative humidity falls to 75% or less“ (when tested by use of a hygrometer). Where the dryness of concrete cannot be guaranteed it is recommended that a vapour barrier is installed (minimum 1000 gauge). The provision of access to services is most successful if the location of services is detailed at an early stage. Services should be kept at least 150mm away from walls to allow space for perimeter bearers. The height of bearers must be adequate to provide clearance for services. Do not notch bearers where services cross. Place bearers on either side of the services leaving a gap of 25mm on either side. Gaps where services penetrate the floor should be filled with acoustic sealant. 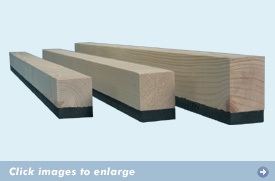 Bearer centres must not exceed 400mm for 18mm or 600mm for 22mm chipboard. These bearer centres are based on a Uniformly distributed load of 1.5kN/m3 and Concentrated load of 1.4kN as specified for self contained, single family dwelling units in accordance with BS6399-1 : 1996. In areas where heavy loadings are anticipated (such as kitchens and bathrooms) centres should be reduced to 300mm between Danskin Park Bearers to provide additional support. In cases of extraordinary loading advice should be sought from the specifier or manufacturer. Storage heaters are considered to be an extraordinary loading and will require support direct from the subfloor, independent of the flooring system. Partitions should normally be erected from the subfloor. Where lightweight non loadbearing partitions are built from the top of the floating floor a double row of Park Bearers should be placed beneath the partitions. Perimeter gaps of a minimum of 10mm should be provided between the chipboard edge and any rigid upstand such as walls or columns. Perimeter gaps for large floor areas should be based on a gap of 2mm per metre run of floor. 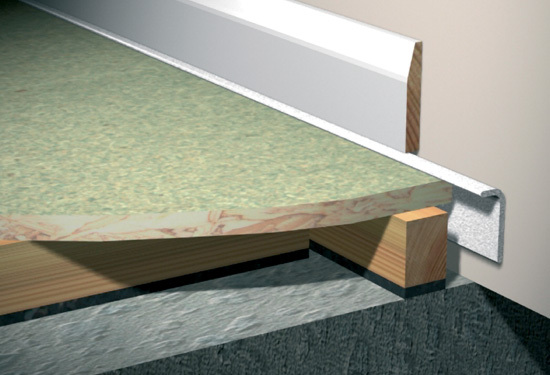 For floors over 5m in length, additional intermediate expansion joints should be considered. BS6399 : 1996 imposes more onerous load bearing requirements for communal areas in certain designs of flatted developments. Concentrated load requirements over the long term can be as high as 4.5kN. 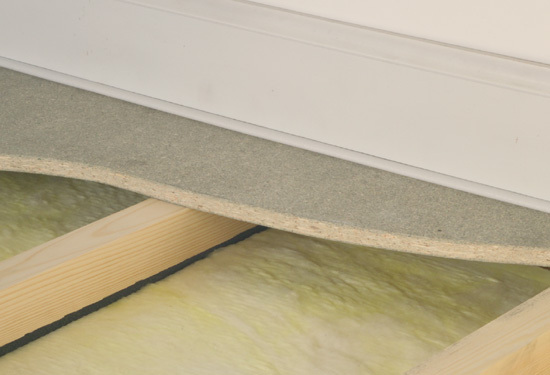 If it is intended to lay a floating floor in communal areas in flats such as common corridors, hallways, stairs and landings it is essential to contact Danskin for specific advice regarding the floor boarding and component centres. It is recommended that Bearers are placed continuously around the perimeter of the room approximately 50mm from the wall for optimum support. A Park Bearer should also be placed across each threshold. 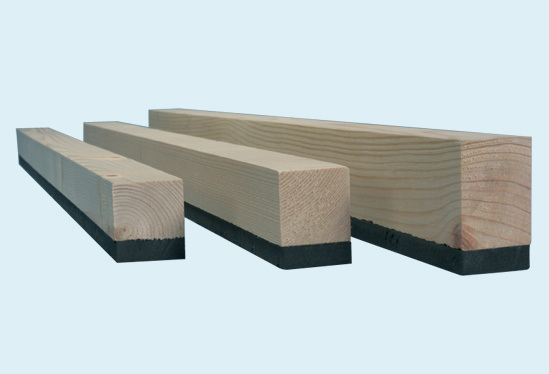 Where very minor subfloor irregularities are encountered continuous packing may be placed beneath the Bearer to provide support or firring pieces can be nailed to the top of the Bearer to level the floor. In the event that substantial packing would be needed the Danskin Saddle System should be used instead of Park Bearers. As acoustic floors are designed to deflect vertically in order to reduce impact sound there are inherent risks in laying ceramic tiles on top of floating floors. However the risks can be significantly reduced by good detailing and the use of modern flexible adhesives. Ceramic tiles have been successfully laid on floors incorporating Park Bearers for many years. Contact the Sales Department for specialist advice. NBS Specification Clauses can be provided for Danskin Park Bearers. To ensure correct installation of the floor the detailed fixing instructions must be followed carefully. Copies of these instructions should be obtained from the manufacturer. The installation of Park Bearers is simple and can be undertaken by competent carpenters. Alternatively, experienced fixing contractors can be recommended who can undertake to supply and fix the bearers in most parts of the United Kingdom. All components should be stored inside, under cover and in dry conditions. Park Bearers are supplied on curtainside vehicles ready for forklift unloading by site. 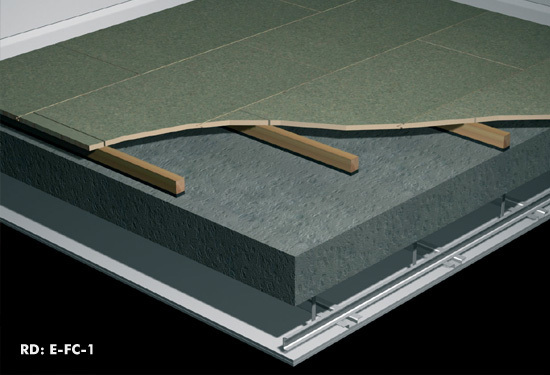 The company also manufactures the Danskin Saddle System - a range of acoustic and thermally enhanced floor levelling systems suitable for a wide range of subfloors and the Danskin Reflex Bearer - a high performance acoustic bearer for use in timber frame and masonry construction. Danskin has now merged with CMS Acoustics to form CMS Danskin, one of the UK's largest suppliers of dedicated acoustics products.